adobongblog: Dinengdeng + Sisig = happiness! Dinengdeng + Sisig = happiness! The salmon was steaming away merrily on the stove a couple of nights ago when we received a call from friends. "Pupunta kami dyan! Dyan kami kakain!" Oh sure!, I exclaimed. But we were having salmon, and it was cooking in the same way we served it to them some dinners ago. Is that fine? "Ok lang! May dala kaming ulam! Dinengdeng!" And half an hour later, they arrived, bringing with them a pot full of aromatic dinengdeng as well as a small plate of sisig! "O ayan, para hindi mo makalimutan ang Pilipinas!" 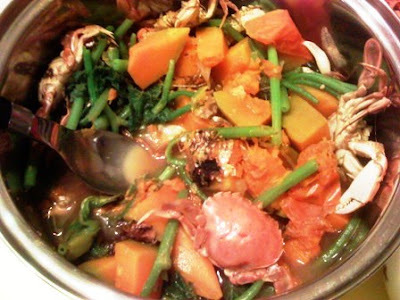 I felt sentimental as I stared at the vegetable goodness, laden with crabs and grilled milkfish! I hope they didn't think I was so touched that I had to take a photo, though. I forgot to explain it's for the blog. And so we had a rather enjoyable dinner as we chatted about life in general while the kids made a general mess of the toys and laughed about. 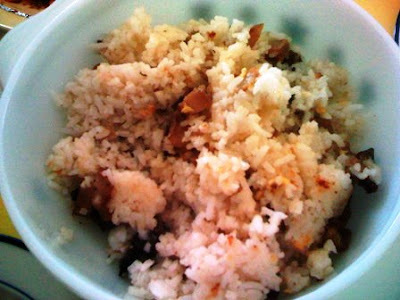 We were not able to touch the sisig, so the following morning it was transformed to fried rice sisig! Happy days. OMG, and it was seafood dinengdeng too? No wonder you forgot about the sisig! haha! I would have just eaten the dinengdeng too. You just made me want to cook some this weekend. Pero punta muna ako sa store. Wala pang gulay from my garden. JMom: It was really nice of our friends to share their wonderful dish with us!